Custom Power Supply Solutions with Zettler Magnetics' Ferrite Switching Transformers » HHP Associates, Inc.
Zettler Magnetics’ ferrite switching transformers support large spectrum of custom power supply solutions. 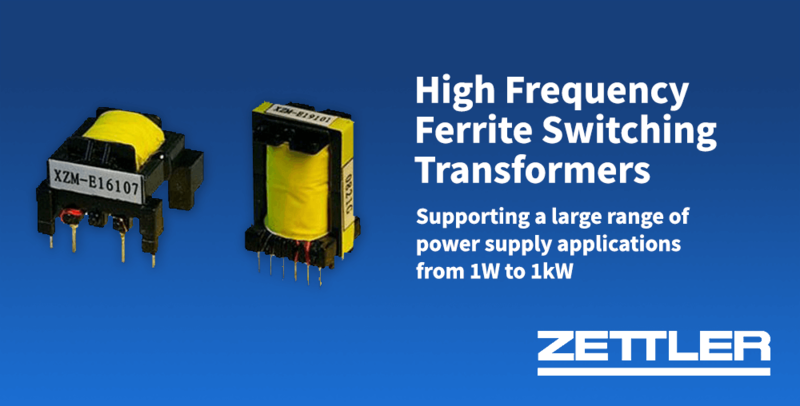 Over recent years, Zettler Magnetics has expanded its range of high frequency ferrite switching transformers to now cover more than 50 different form factors, supporting power supply designs ranging from 1W to 1kW. Selection of the appropriate structure is a critical element in any power supply design, which needs to consider a variety of electrical, safety and mechanical parameters. Appropriate solutions therefore typically involve custom designs. At the same time, customers expect competitively priced solutions. Zettler Magnetics’ response to this challenge is based on a two-pronged approach. An experienced team of transformer design engineers closely engages with customers in regard to individual design requirements, while highly automated production lines support a broad range of possible form factors, allowing them to manufacture high volume custom designs at very competitive prices. Recently, an industry leader in street lighting control requested Zettler Magnetics to design a 2.6W wide input range custom switching transformer. The customer had unique requirements for operating temperature, UL Class B insulation, and physical size constraints within the controller. Zettler was able to design a custom transformer meeting all of these design parameters. The bespoke design was tailored to suit Zettler’s high volume automated production line capabilities, resulting in a highly cost-effective solution for this transformer application. Zettler Magnetics manufactures more than 40 million switching transformers each year to support a diverse range of applications from washing machines and kitchen appliances to lighting and IoT. Many of these high volume designs are manufactured on fully automated production lines in Zettler’s wholly owned manufacturing facility in Xiamen, China. Please contact us with any of your switching transformer needs and visit the Zettler Magnetics website www.zettlermagnetics.com for further details. We are honored to serve as a manufacturer’s rep for Zettler Group, which specializes in LCDs, relays, transformers, toroids and inductors.